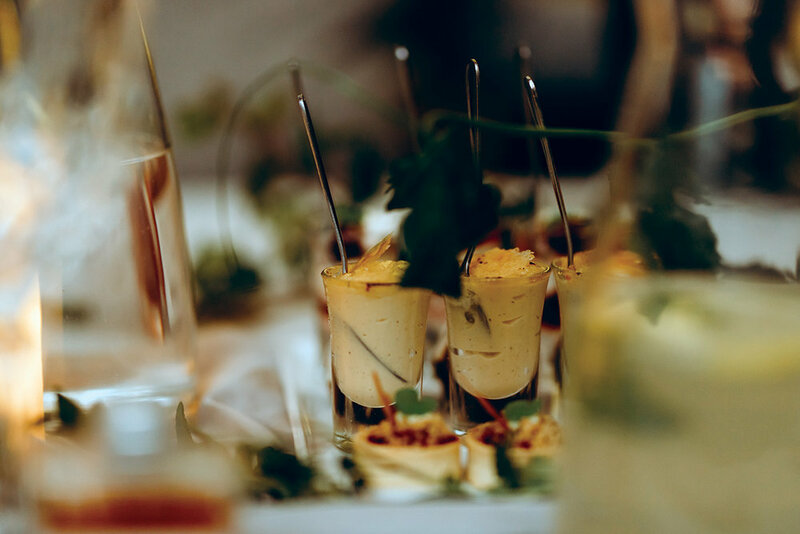 Fine dining on winter's solstice — everAFTER magazine everAFTER magazine celebrates and inspires a couple’s journey from their engagement through to their wedding day and beyond including lifestyle and travel. Wedding venues, bridal, fashion and styling inspiration. everAFTER magazine celebrates and inspires a couple’s journey from their engagement through to their wedding day and beyond including lifestyle and travel. Wedding venues, bridal, fashion and styling inspiration. 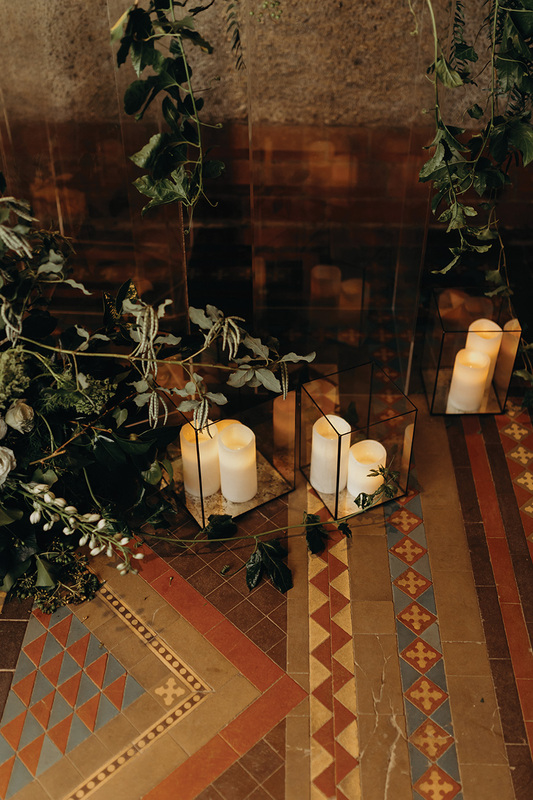 everAFTER, Mr Theodore and Bursaria Catering hosted an evening on winters shortest day of the year, in the hauntingly beautiful Abbotsford Convent with some of the best in the wedding industry. Ruby & James created sophistication and warmth to the room with the use of scattered candlelight held within votives from The Small Things Co. Stunning white floral filled with whisping ivy and foliage that draped entrances, cocktail bar and signage. "We wanted guests to feel like they were entering a magical winters event," said Jess from Ruby & James. BEAUTIFUL HISTORIC ARCHITECTURE AND ARTWORK WERE USED AS BACKDROPS IN THE STYLING OF THE ROOM. 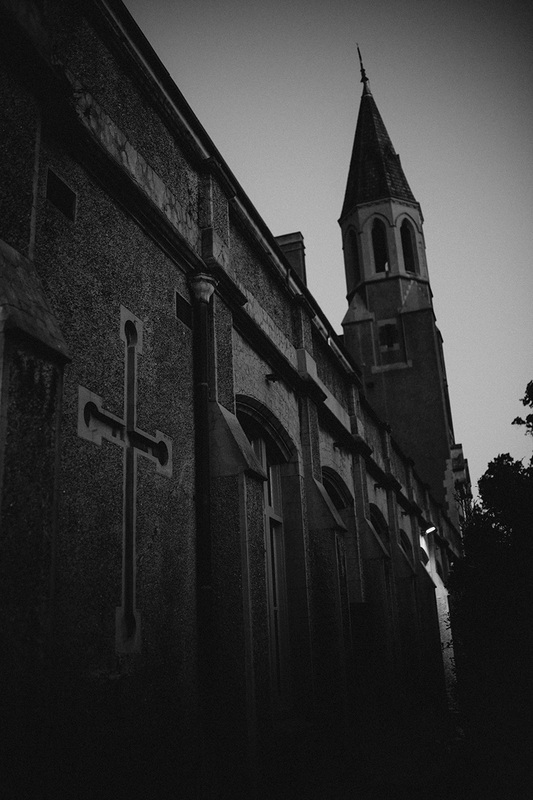 The Abbotsford Convent itself has such a diverse history, from a meeting point for the Wurundjeri and Kulin Nation people, to a convent housing over 1,000 women and children, to a university, to the largest multi-practice creative precinct in Australia . The Convent building was where most of the Sisters, nuns-in-training and women commencing life as nuns lived. The Mural Hall was the western corridor of the building where nuns passed from one area to another. The mural was painted by the nuns and depicts the Calvary. Lavishly decorated fire places in the are rendered in an art form known as pokerwork and when you visit, look closely at the timber as the some of the window frames and doors has been stained by the nuns to take on the appearance of wood grain. All is not what it seems. 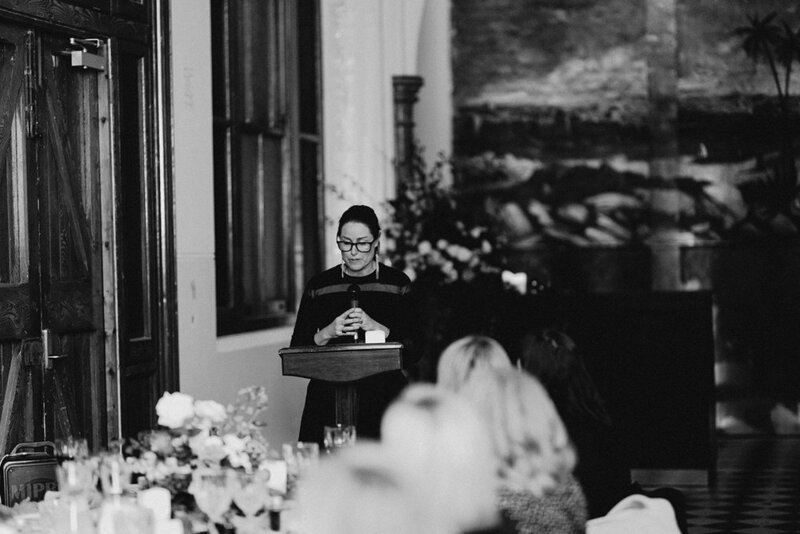 Bursaria Fine Foods have been catering for weddings and a events at the Abbotsford Convent for over 7 years and have been actively working with the Convents Foundation to activate new and exciting creative spaces. The precinct and its venue spaces have grown and last year, the Abbotsford Convent joined iconic landmarks including Sydney Opera House and Royal Exhibition Building in receiving one of Australia’s highest level of heritage recognition to become the 111th site added to the National Heritage List. We added an element of warmth to a chilly night with Bursaria Catering serving Mulled Wine to guests on arrival. 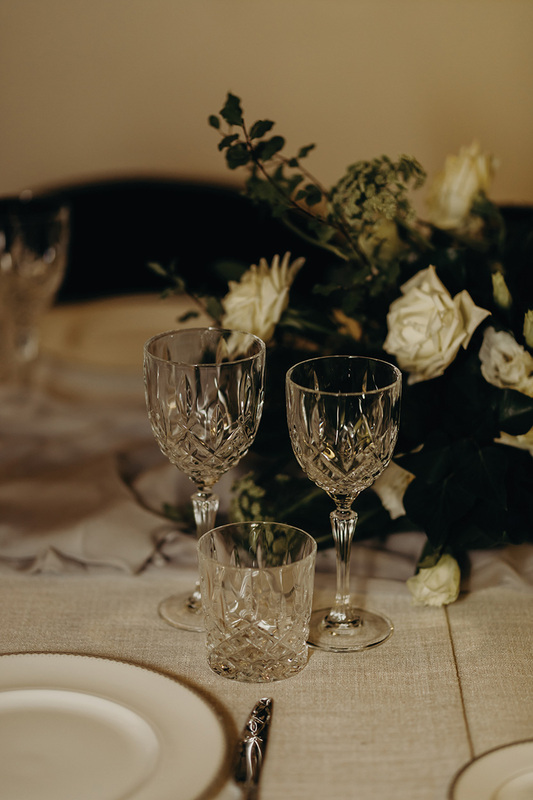 Served in stunning Waterford glassware, no one just stopped at one! We share this beautiful recipe to enjoy for yourselves. Use a speed-peeler to shave large sections of peel from the orange, lemon and lime. Put the sugar in a large saucepan over a medium heat, add the pieces of peel and squeeze in the clementine juice. Add the cloves, cinnamon stick, bay leaves and about 10 to 12 gratings of nutmeg. Halve the vanilla pod lengthways and add to the pan, then stir in just enough red wine to cover the sugar. Let this simmer until the sugar has completely dissolved into the red wine, then bring to the boil. Keep the mix on a rolling boil for about 4 to 5 minutes, or until you’ve got a beautiful thick syrup. It’s important to make a syrup base first because the sugar and spices need to get quite hot, but if you heat them this high once you’ve added the wine, you’ll burn off the alcohol. When your syrup is ready, turn the heat down to low and add your star anise and the rest of the wine. Gently heat the wine, and after around 5 minutes, when it’s warm and delicious, ladle it into heatproof glasses and serve.